When we first arrived in Japan, it was mid August, 32 degrees (hotter than Vegas!!) and it was a shock. I was prepared for change and the instant feel of loneliness that you get with any move but I wasn’t quite prepared for the overwhelming culture shock that hits you when you try to conduct any of your normal day to day tasks. The walking around supermarkets trying to figure out what the endless array of sauces and strange looking vegetables are when very little looks familiar. Looking at food menus and taking pot luck on what you are ordering, praying that it is hot and not some strange sea creature from the deep! Trying to work out the washing machine, air conditioning and the ATM machine which are all in Japanese! And not in simple hirigana or katakana either but Kanji just to make life that little bit simpler! But the longer you live here, you start to appreciate the more interesting things Japan has to offer! Heated toilet seats in the winter are like a gift, their train system that is regular and on time and have I mentioned how good the meat is here? Yes you heard me clearly those who know me well… meat! In the short time I have lived here so far (4 months) I have seen and achieved so much. In October we took a day trip to Kamakura which was just stunning. It is a very traditional Japanese village with a high concentration of shrines and temples that are all beautiful and unique in their own way. If you go to the tourist information desk at Kamakura station they will give you an English map which is well worth getting if there are specific spots you want to see like we did. The one place I was desperate to see was the Giant Buddha (called the Kamakura Daibutsu) which was a bit of a walk but worth it. I have to admit it is a very touristy spot surrounded by foreigners taking selfies and photographs but if you sit down long enough to spot a local stopping by to make an offering or prayer, you get to see why it is so important. By December, we had decided to spend Christmas here in Japan. I had heard that it would be hard because the Japanese do not celebrate it, it holds no religious or cultural significance for them so we were surprised to see the festive lights and Christmas music playing in almost every restaurant and shopping mall as early as the 1st November. But the closer to Christmas day we got, the more we realised that the lights were nice and the music encouraging but the meaning was empty. I am a teacher here in Japan and the hardest part of Christmas was teaching children who just did not get it. They weren’t interested in listening to music or making decorations. They had no gifts to look forward to, family traditions that were special and worst of all no excitement!! We decided for that reason that we would do something different this Christmas so we booked to go to Osaka, Japan’s second largest city. 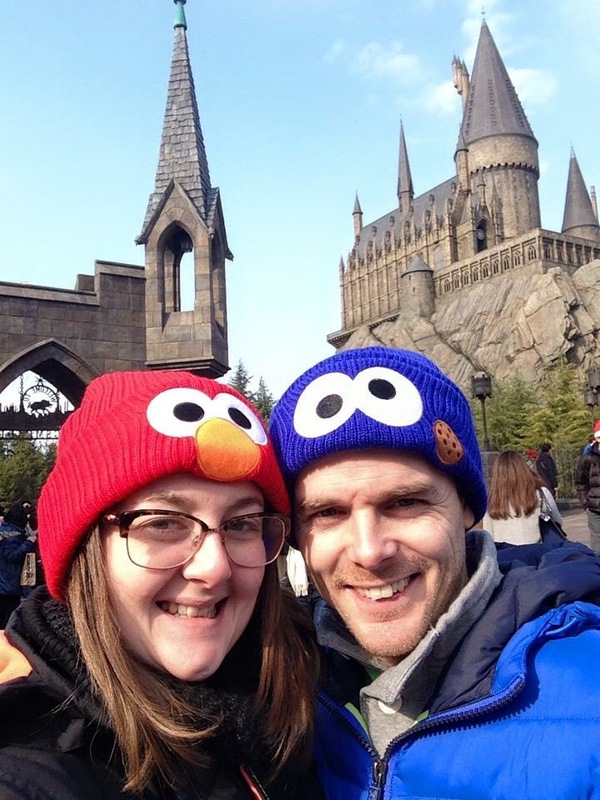 We treated ourselves to the Hilton hotel (I know not very traditional) and a trip to Universal Studios Japan on Christmas Eve. When it came to the sights, Osaka castle deserves its title as the city’s most iconic tourist attraction. Its beautiful architecture and lengthy history makes for an interesting day trip and the aquarium is just incredible. The tanks are the largest I have seen and its layout is very clever allowing you to see the sea life from various depths giving you a real sense of what life is like under the surface. It certainly served as an excellent distraction from our potential holiday gloom. New Year is a very important holiday in Japan which we decided to celebrate back at home in Chiba prefecture. There are a lot of traditions conducted on this day starting with a midnight visit to the local shrine or temple. The Japanese people descend in their thousands to the bigger shrines in central Tokyo queuing for hours to make their prayers and wishes for the new year and purchasing their new lucky talismans before staying up to watch the first sunrise of the new year. Our new year was slightly different starting with a boat trip down the river from Asakusa then taking a walk down to Daimon where we visited Zojo-ji Buddhist Temple before the midnight rush. It is a beautiful sight at night with both the temple and Tokyo Tower illuminated in the same skyline. We then finished the night with the enjoyable Japanese past time of karaoke and drinks. A thoroughly fun night! I have experienced so many traditions that are unique to Japan and very different from my own. It would be unrealistic to say that my experiences so far have not changed me or my outlook on life. Just the act of moving from ‘home’ forces us to evaluate our perspectives on life. What were our lives like before and has the changes we made better or worse? There have been changes for the better. I have a ten minute bike ride to work instead of an hour commute stuck in traffic. Being a teacher, I can enjoy teaching again without worrying about the pressures and paper work enforced by governmental policies and expectations. Eating with chopsticks is actually much nicer than eating with a knife and fork once you can get to grips with them (it takes a while) and the way they cook meat here, has changed my life forever. The Japanese people are very polite and helpful creating such a safe culture. You could find yourself in the centre of Tokyo during the early hours of the morning and would never have to worry about a thing. You could leave your mobile phone in a restaurant and it would still be on the table where you left it when you returned hours later to collect it. The only thing that I struggle with is the feeling you can get from some of the older people when you are out and about in less touristy areas. That feeling that you are different, that you are a ‘Gaijin’ (foreigner) but it is easy to deal with and no one is out right rude. I am thoroughly enjoying my time in Japan so far and I am excited for my many future experiences and adventures but the first term has exceeded all expectations. Here’s to an adventurous 2015!! Previous Post Count down until we go… 4 months! !